Published: Jan. 25, 2015 at 09:32 a.m. Updated: Jan. 25, 2015 at 12:20 p.m. The NFL will use Sunday's Pro Bowl as a testing ground for speeding up instant replay. Troy Vincent, the league's football operations chief, said Saturday that officials will lean on Microsoft Surface tablets for video reviews in the annual all-star game, a move that might ultimately eliminate zebras from going "under the hood" for replay calls. 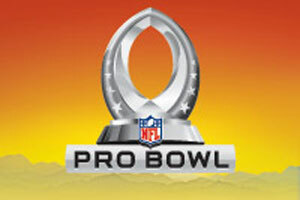 Tune into NFL Network's Pro Bowl coverage, Sun. at 5 p.m. ET. "The test in the Pro Bowl gives us the opportunity to see the practicality of the technology in game-time situations, make adjustments or improvements where necessary, and also gauge the usefulness of it to the officials," Vincent told The Associated Press. "Certainly, we believe it is an enhancement that we would like to integrate in the future." The AP was told that a league staffer will wear a backpack housing wireless radios while holding a Surface Pro 3 tablet and headphones during the game. Met with a replay scenario, the staffer will hold the tablet while referee John Parry takes over the headphones to analyze the play. The hope is that on-field technology will hasten the replay process, something the league is willing to try in every NFL city this summer. "Preseason testing of this technology is very likely," Vincent said. "The process for regular-season use would involve a review and approval by the competition committee." After a postseason haunted by a variety of controversial replay calls, anything the league can do to improve the process will be welcomed.